And marshmallows! It's cold. Which means it's time to grab a mug and cozy up. 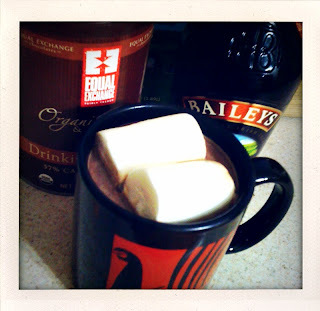 I noticed my cupboards were barren of hot chocolate, so I went by the new EarthFare (store #420!!) and picked up some Equal Exchange drinking chocolate and 'mallows. I mixed the cocoa with H20 leaving plenty of 'room for cream' so that I could add an ample amount of delicious Bailey's to make the hot chocolate creamy and keep me toasted! Place 1 serving powdered hot cooca in your mug. Boil water and pour in mug, leaving 1-2 inches for the Irish Cream. Top off with Irish Cream and Marshmallows! oh yum! what a great combo in a cup! i recently added a nip of Silk Nog to the mix and it is soo yum!